With the increased demand for finer finishes and the adding of additional sanding heads to the primary sander to achieve this finer finish, problems with streaks, raised nap and surface imperfections started to appear on the panel surfaces. 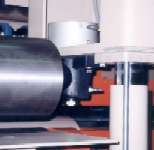 To support the industry, Kimwood developed the Crossbelt Sander in 1995. With the introduction of the Crossbelt, producers of particle board and MDF board now have a way to produce panels with a highly polished finish. The Crossbelt was designed to eliminate these surface imperfections and to provide a smooth polished finish by changing the appearance of the abrasive belt scratch pattern. The emphasis is simply on polishing with less than .001" generally removed from the panel surface. Hence it is not intended to remove stock or to provide panel dimensioning. Typically a 150-grit belt will provide a final polish of 180-grit. Customers claim the surface imperfections are minimized if not totally eliminated with the Crossbelt. The Kimwood High Speed Crossbelt Sander is furnished in multiple widths ranging from 4' to 10'-6" wide and feed speeds up to 200 ft/min. The platen bar has a triple adjustment feature, consisting of a thick or thin platen height fine adjustment, platen tilt adjustment and center adjustment (7' to 10'-6") which allows for correcting concave or convex sanding. There are two air loaded smooth steel pinch rolls and two bottom smooth steel driven feed rolls with one set on each side of the cross belt to feed and stabilize the panel. The bottom feed rolls are driven by a A.C Variable Frequency Drive unit with a top speed of 200 ft/min. Kimwood maintains historical files for all of it products lines. As a result of this, almost all of the equipment originally supplied can be manufactured from our files. Kimwood also can reproduce most machine assembly drawings and original manuals for those pieces of equipment. Click "Parts, Manuals, & Assembly Drawings" for more information. The Kimwood Crossbelt is a relatively new sander to the industry. In this regard there is no active rotating rebuild / replacement program in place. This does not mean Kimwood would not entertain a request to rebuild all or a part of a Crossbelt or, take an older Crossbelt in on trade against a new purchase. We would ask that you contact the Kimwood sales department directly for rebuilding / replacement information.